So you want to open a new restaurant? How do you decide what types of restaurant you should open? What is the most likely to be successful in your area? Casual family dining? A small café? A trendy franchise? The type of restaurant you open will depend on the type of owner you want to be. Are you a hands-on cook at heart? A business minded franchisee? Or a people-person who will charm your guests in the restaurant dining room? No matter what type of concept you want to open, it’s important to be flexible. You will have to adjust your original ideas to accommodate any number of changes that come with opening a new restaurant. Decide What Type of Restaurant You’ll be Most comfortable Operating. If you are considering opening a restaurant, chances are you enjoy eating out. What types of restaurants do you enjoy dining at? Fine dining? A laid back diner? Different types of restaurants require certain types of management. They should have great food and customer service and clean and inviting atmosphere. But more upscale restaurants require attention to detail that isn’t always necessary in less formal eateries. Once you’ve decided on the type of restaurant you want to open, the next step is to research if there is a viable customer base. Is there a big enough population base for your idea? Do the local demographics support your assumptions about who will come to your restaurant? For example, if you are hoping to attract single professionals in their 30s, is there really enough of this population to support your restaurant? Or is the area population very young or very old? Never assume there are enough people in your area to support a new restaurant. You can research demographics through your local chamber of commerce or small business bureau for more information. Read more about population bases and market research. Your menu is why people want to try your restaurant out in the first place. When you sit down to write your menu, consider item description, page layout and prices. Check out 10 things to Know About Writing a Menu for more tips. So you’ve got your theme and your market research done. Now it’s time to look for the perfect location. This is perhaps the most crucial step in opening a new restaurant. The location can make or break a new restaurant. A good location can equal success, but a bad location almost always equals failure. There are a lot of variables to consider when looking for a new restaurant, including size, length of lease and monthly rent or mortgage. Other considerations include fire and safety codes. 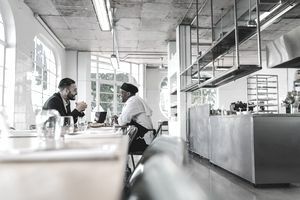 Before you commit to any special location, first read about how to negotiate a restaurant lease. If you find a really good location, you may need to alter your initial restaurant plan. Maybe it won’t seat as many people as you had originally planned or the kitchen is far smaller than you anticipated. Being flexible will allow you to work around these problems. Once you have decided your restaurant concept, found your location it’s time to write a business plan, which you will need for any kind of financing. Think of your business plan as a road map to opening day. It will help you determine how much money your restaurant needs to make each day, to cover overhead. It will also force you to think about potential problems and how you will deal with them. Read more about writing an effective restaurant business plan. Should Buy a Restaurant or Open Your Own?